Christopher Robin is a new live-action adaptation of the classic Disney cartoon based on the revered book series from A. A. Milne and E. H. Shepard. The story follows an older Robin (Ewan McGregor) who now works at a luggage company in London and is forced to work over the weekend, preventing him from spending time at his childhood cottage with his wife Evelyn (Hayley Atwell) and his daughter Madeline (Bronte Carmichael). However, Robin’s old friend Winnie the Pooh (Jim Cummings) stumbles upon him and asks for his help. Together, they go on an adventure back to the Hundred Acre Wood and Robin will hopefully regain his sense of imagination along the way. I was excited for Christopher Robin because I loved the cartoons when I was younger and because it reminded me of the underrated Steven Spielberg film Hook about a grown-up Peter Pan who returns to Neverland in order to save his children. Although Christopher Robin has flaws, it is still a family movie that I would recommend seeing in theaters. 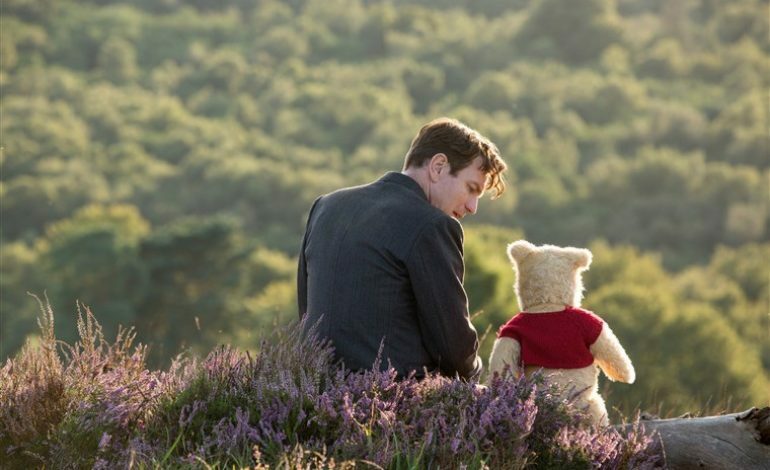 On a technical level, Christopher Robin is mostly at its best. Director Marc Forester is best known for dramas such as Monster’s Ball and Finding Neverland; therefore, Forester directs Christopher Robin as a mostly serious drama with some appropriate silliness often thrown in to keep it family friendly. The film also succeeds in the cinematography and color grading departments. Whereas the Hundred Acre Wood usually looks bright and colorful, the grimy streets of Post-WWII era London look dark and drab similar to a Zack Snyder movie; the latter appearance may bother several moviegoers, but it works for me since it fits that specific tone. Unfortunately, there are times where the color grading is inconsistent. For example, Pooh appears in a place where the colors are vibrant; when the film returns to that place, the colors are somehow gone. This complaint is only a nitpick since I was probably missing something, such as the color palette changing due to the change in perspective. Complementing this dynamic cinematography is beautiful art direction where the Hundred Acre Wood and its sprawling forest landscapes are brought to life. I haven’t even mentioned the amazing visual effects on display. As oppose to resembling their well-known animated appearances, Robin’s friends are more akin to stuffed animals that are rich in detail from the way their eyes move to the way their fur moves. The only creatures that are generic CG animals are Rabbit and Owl, who are sidelined throughout most of the film. Regardless, Disney will make some serious profits from all those Winnie the Pooh plushies that they are selling. There are also animated illustrations that homage the art of E. H. Shepard. Jon Brion composes the musical score with Geoff Zanelli; their emotional compositions consisting of classical instruments such as pianos and violins fit with what is on screen even if it is a mainstream Disney movie. The characters and performances in Christopher Robin are great for the most part. Ewan McGregor proves again why Hollywood needs to hire him in more lead roles. Similar to Robin Williams in Hook, McGregor is believable as a grown-up Christopher Robin who has almost forgotten about his youthfulness and has become a workaholic who barely has time for his wife and daughter. McGregor also effectively demonstrates the lighthearted side of Robin as shown in a certain scene with Eeyore. Even more impressive, McGregor interacts with inanimate objects so well to the point where we can believe that he is interacting with real talking animals. Speaking of which, each animal is so accurate to its original iteration. Pooh is still naive yet loveable, Tigger is still energetic yet friendly, Eeyore is still depressed yet caring, and Piglet is still nervous yet brave. Pooh obviously steals the show here. Even with his new appearance, he is still that kind teddy bear that no one would want to forget. All of the voice actors are incredible especially Jim Cummings who can still bring personality to both Pooh and Tigger. One of my few problems with the characters in Christopher Robin is a problem that I have with many mainstream movies: families are more plot devices than characters. I am not as concerned with Mildred since she has a problematic relationship with her father and is significant to the third act. The character I take most issue with is Robin’s wife Evelyn who is not that interesting and is not useful to the plot outside of one or two scenes. Both characters are still well acted at least. The screenplay of Christopher Robin is not without problems but is still far from bad. This film knows how to bring audiences into nostalgia without it feeling forced or unnecessary. In accordance to the source material, Christopher Robin has many scenes that will warm moviegoers’ hearts and features some relatable messages about appreciating life. In one scene from the trailer, Evelyn lectures Christopher about his negligence saying, “Your life is happening now, right in front of you.” That is so inspiring for all the Eeyores of the world. It is certainly a film that families should see even if it not suitable for all children because of a short scene where Robin is fighting in World War II. The story is somewhat generic, but it is still one that is quite entertaining to watch even though some scenes are more enjoyable than others. Unfortunately, the story is quite predictable, which is unsurprising since other movies have done it better. Additionally, I do wish the themes and messages were more creative even though I did like them. Christopher Robin is a decent family film that achieves what is supposed to achieve. Despite not offering many surprises, the film features plenty of fun and emotion complete with skillful performances and even better visual effects. I am sure it will grow on me similar to how Hook grew on me.